Learn to read your reports page, use filters and see what are the key metrics to pay most of your attention to. The Reports page lets you monitor the overall performance of your campaigns by certain metrics. The page includes the Filters, Key Metrics and Top 10 Detailed Breakdown sections. All data is historical, so you can select dates to analyze performance at a particular period in time. The data on this page is displayed based on the timezone set in the account settings. When you select any time range for reports, they use the time range in this timezone. The given metrics are bound to the date of email sending. 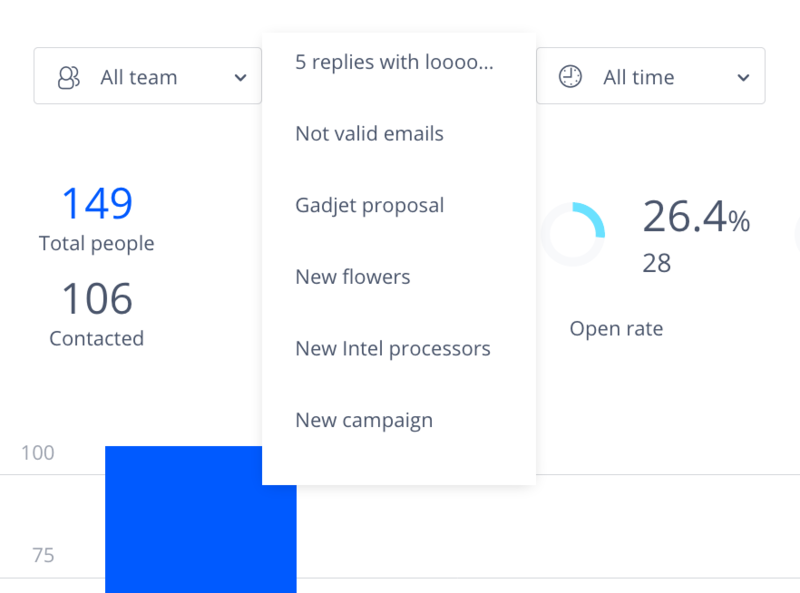 You can filter the statistics by the following filters - Team, Campaigns, Time. All filters are applied separately. The Key Metrics section contains statistics metrics that help you measure the success of your campaign. Total people - Number of contacts participating in the campaign. Contacted - Number of contacts that have received your emails. Delivery rate - Number of delivered emails and ratio between the Total people and Contacted key metrics. Open rate - Number of opened emails. Open rate is calculated on the basis of the Contacted key metric. Reply rate - Number of replied contacts. The Reply rate is calculated on the basis of the Contacted key metric. Reply rate = Number of replied people / Number of contacted people * 100%. 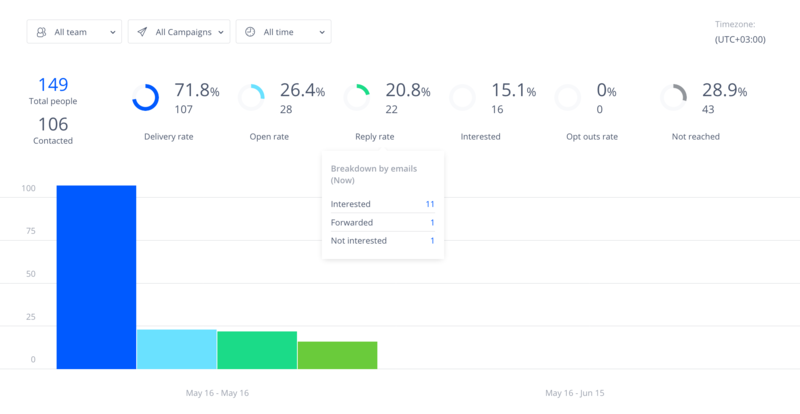 Interested - The Interested key metric shows how many contacts were interested in your email. The key metric uses an intricate algorithm based on numerous factors. Opt outs rate - The Opts outs rate key metric shows how many people unsubscribed from your email after opening it. Not reached - The Not reached key metric shows how many emails have not been delivered for a variety of reasons. See the explanation in the Breakdown for not reached prospects section. Out of Office - The email was delivered but the recipient has set the automatic out of office reply in their email client. Bounced - The email could not be delivered because the recipient does not exist or email is not valid. Auto reply - The email was delivered but the recipient has set the automatic reply in their email client for all incoming emails. This section lets you see more information on a campaign's performance. There are three views: Team, Campaigns, Templates. Use them in combination with filters from the Filters section.